Motoring advice in the 1920's. Homepage. This page: A handy motorists' booklet published in the late 1920s by Temple Press Limited. Motorists' information leaflet from the 1920s. This slim publication was published in the late 1920s, and was designed as a pocket-sized guide to motoring in the late-vintage era. The cover illustration shows a couple enjoying a spin in their vintage motor-car. The car's registration is GU 8532, a London series that only ran from March to May 1929. Excluding the outer cover, there are just twenty pages in this guide to driving a car. Pages 1 thru 7 describes the major routes in and out of towns and cities such as London, Birmingham and Manchester, listing the smaller locations that they pass through. 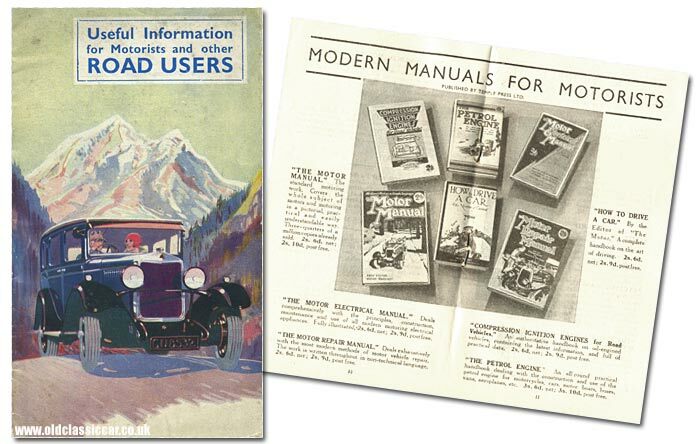 At the time, Temple Press produced a number of books and magazines relating to driving and car maintenance. Pages 8 and 9 describe their motoring and marine journals in more detail. The following titles are introduced: The Motor, The Light Car & Cyclecar, The Commercial Motor, The Motor Boat, The Motor Ship, Motor Cycling and Cycling. Probably best known of those titles is The Motor, described as ".. the National Motor Journal, is a journal for the average motorist. It shows him how to get the best out of motoring, and keeps him in touch with the latest developments. The Motor is first out with reports of all races and trials." The Motor Manual. The standard motoring work. Covers the whole subject of motors and motoring in a pictorial, practical and easily understandable way. Three-quarters of a million copies already sold. The Motor Electrical Manual. Deals comprehensively with the principles, construction, maintenance and use of all modern motoring electrical appliances. The Motor Repair Manual. Deals exhaustively with the most modern methods of motor vehicle repair. The work is written throughout in non-technical language. How To Drive A Car. By the editor of "The Motor". A complete handbook on the art of driving. Compression Ignition Engines for Road Vehicles. An authoritative handbook on oil-engined vehicles, containing the latest information, and full of practical data. The Petrol Engine. An all-round practical handbook dealing with the construction and use of the petrol engine for motorcycles, cars, motor boats, buses, vans, aeroplanes, etc. Also available were books titled Motor Cycling Manual, The Motor Boat Manual, The Motor Ship Reference Book, Cycling Manual, and The Profile Road Book which showed, in profile, the gradients of main routes throughout the country. The driving licence & road tax. If a car wasn't on the road, no tax was payable or other declaration required, unlike today's system where they have to be declared SORN else you incur the wrath of a silicon chip deep within the annals of DVLA. Some information which is handy for anyone running a vintage car today, regarding the sizes of letters to be used on a car's registration plate, is given on page 14 of this booklet. Painted figures and letters had to be white on a black background, each figure or letter being 3.5" tall, 5/8ths" line width, with the space occupied by each (apart from the number 1) being 2.5". Letters could be painted on a flat plate, or on a flat unbroken section of the car's coachwork. Alternatively, cast or pressed aluminium numberplates could be fitted. Following on from a list of motoring do's and don'ts, courtesy of the National "Safety First" Association, there are descriptions and diagrams of all recognised hand signals, for motorists and drivers of horse-drawn vehicles. 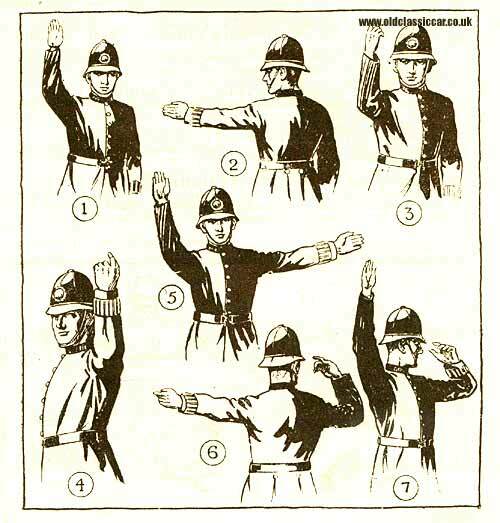 Signals given by Policemen on duty are also described. This was at a time when members of the Law could often be seen at busy road junctions, directing the traffic and generally maintaining an air of decorum on the highway. Driving around in unmarked Vauxhall Vectras, and pointing radar guns out of the back of horse trailers on country roads, was very much a thing of the dim and distant future.